Our understanding of cannabinoid science improves with every single study published. 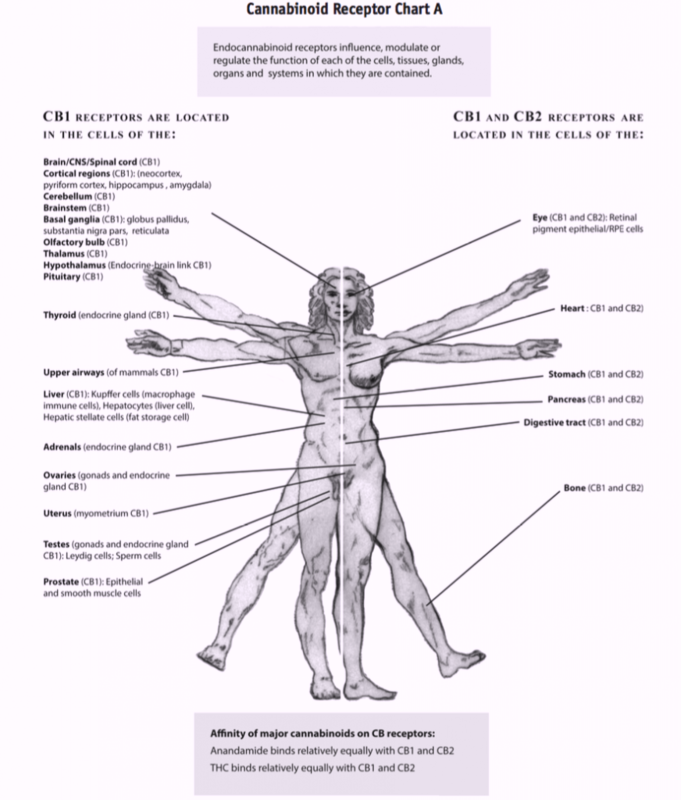 Since the re-discovery of the endocannabinoid system, we have attempted to map the complex relationship between the plant, its chemical constituents, and the way these compounds interact with our bodies. For decades, the facts of cannabis science have evolved as we better comprehend cannabinoid synthesis, genetic hybridization, and the formation of the cannabis plant in general. A recent study published in the Journal of Natural Products examines the evolution of major cannabinoid and terpene production during a growth cycle of three different cannabis chemotypes. This study monitored three chemotypes of cannabis, each defined by the ratios at which they produce the acidic forms of the two most researched cannabinoids: THC (tetrahydrocannabinol) and CBD (cannabidiol). In this study, titled “Evolution of the Cannabinoid and Terpene Content During the Growth of Cannabis sativa Plants from Different Chemotypes,” the results indicate that patterns exist within different cannabis chemotypes, which is very valuable data for breeders, cultivators, and scientists. Determining the best methods for optimizing production of specific cannabinoids is difficult work. The results of this type of work will ultimately lead to more efficient production patterns. Cannabis plants with high THCA/CBDA ratios are generally classified as drug-type plants. Cannabis plants with substantially higher amounts of CBD (chemotype III) are typical fiber-type plants. There are two other chemotypes (IV and V), both for fiber-type plants. 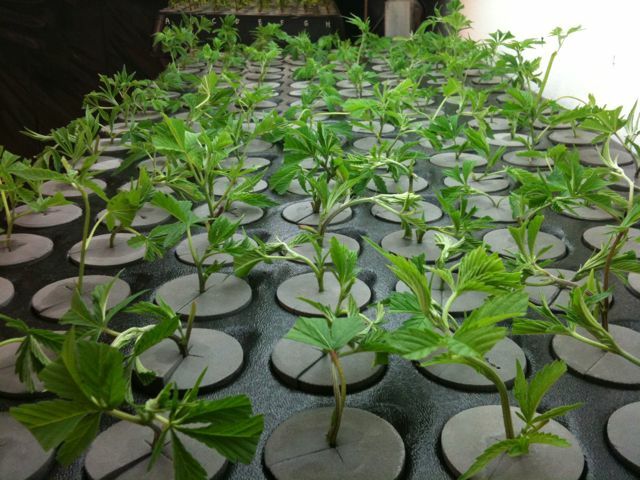 The study measured cannabinoid and terpene growth from the root growth phase (R.G. ), through the vegetative phase (V.P. ), and even goes past the flowering phase (F.P.) 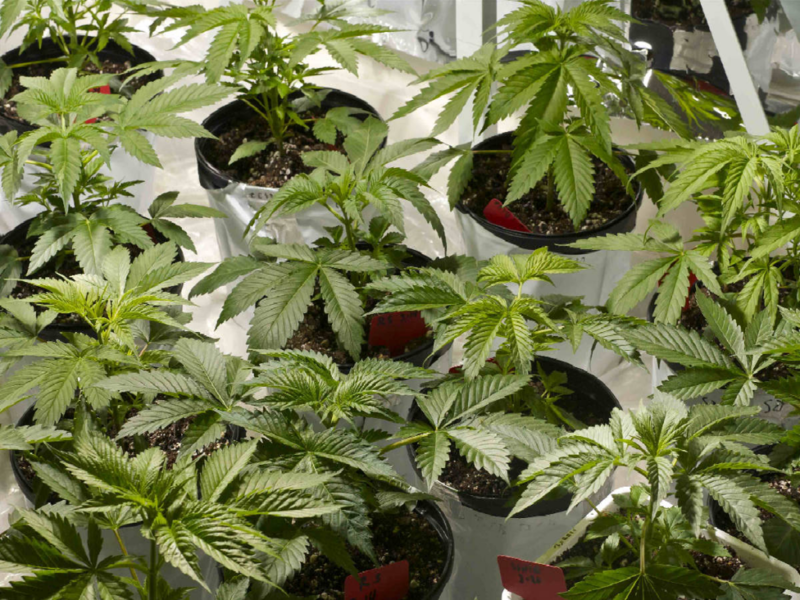 to examine post-flowering degradation of cannabinoid production. The researchers analyzed clones from stable mothers that produced standardized chemotypical content. Approximately 50 clones were taken from each mother; chemotypes I and III were represented by three mothers each, and chemotype II was represented by only one mother. All of the clones were grown indoors under controlled conditions to eliminate as many variables as possible (20-28* C and 40-70% humidity). The results and discussion of this study are complex, and you are encouraged to go and read through the full publication (4 pages) to see all of the supporting informational materials (57 great reference points). 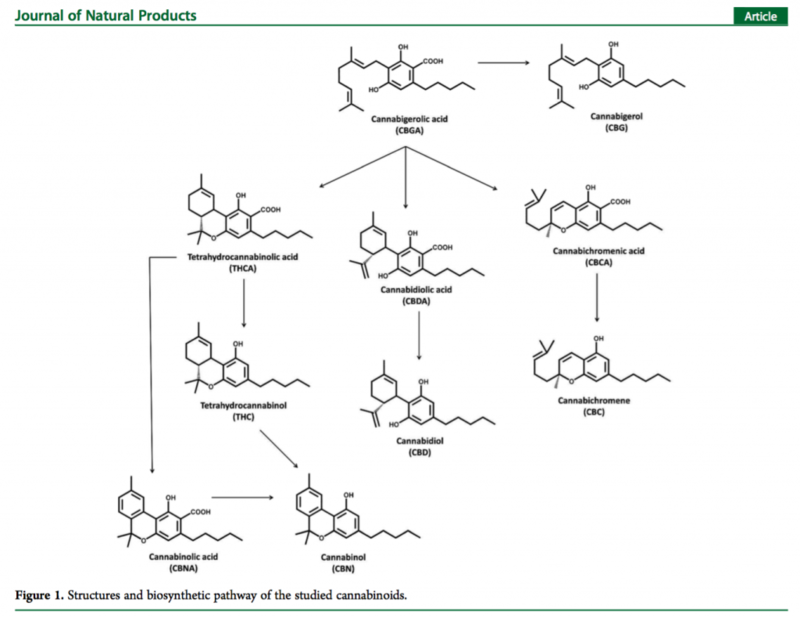 Above is the first graphic presented: a simple cannabinoid synthesis chart presented within the study. Beyond THC and CBD, the researchers examine the presence of CBGA, the precursor to THCA, CBDA, and the less-known CBCA. Figure 2 shows the content (mg/g) of three different cannabinoids (CBGA, CBDA, THCA) in the three different chemotypes (I, II, III) researched in this study. 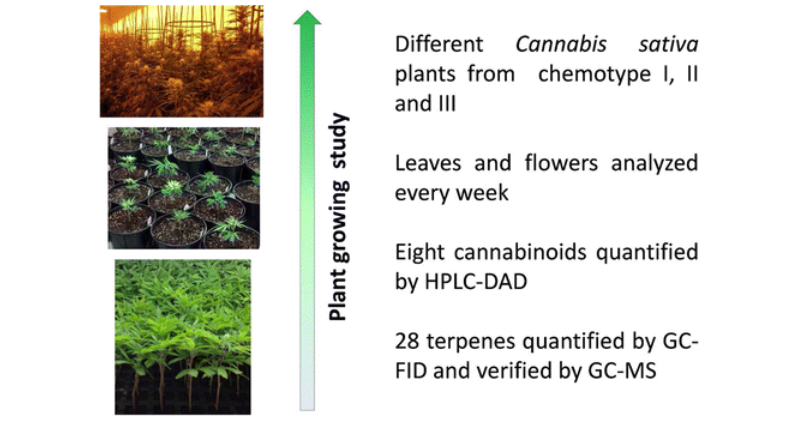 The graphs on the left are the cannabinoid contents of the leaves throughout the growth cycle, and the graphs on the right represent the cannabinoid content found within the flowers. Please be advised on a publication typo: the y-axis of the CBGA graphs mistakenly reads CBDA content. From the results shown above in Figure 2, you can see the patterns of cannabinoid production within each chemotype, and also the similar patterns of cannabinoid production between each chemotype. The concentrations of THCA and CBDA in the leaves exhibited the same evolution for every chemotype. 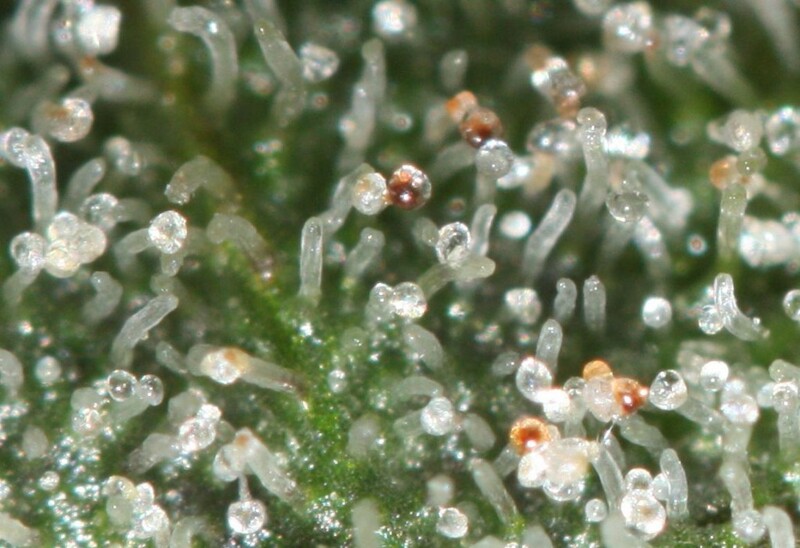 Another similarity that was to be expected was that regardless of chemotype, a major increase of cannabinoids was evident during the initial stages of trichome development. As for CBGA, the concentration of CBGA “remained constant in the chemotype I plants, whereas it decreased in plants from the other two chemotypes” after the flowering period had commenced. The authors of this study found this synthesis rate of THCA and CBGA in chemotype I varieties to be very interesting, and a subject that deserve future attention. Figure 3 displays data regarding the development patterns of monoterpenes and sesquiterpenes among the three examined chemotypes. Monoterpenes are a class of terpenes that consist of two isoprene units and have the molecular formula C10H16. Sesquiterpenes are a class of terpenes that consist of three isoprene units and have the empirical formula C15H24. Like monoterpenes, sesquiterpenes may be acyclic or contain rings, including many unique combinations. 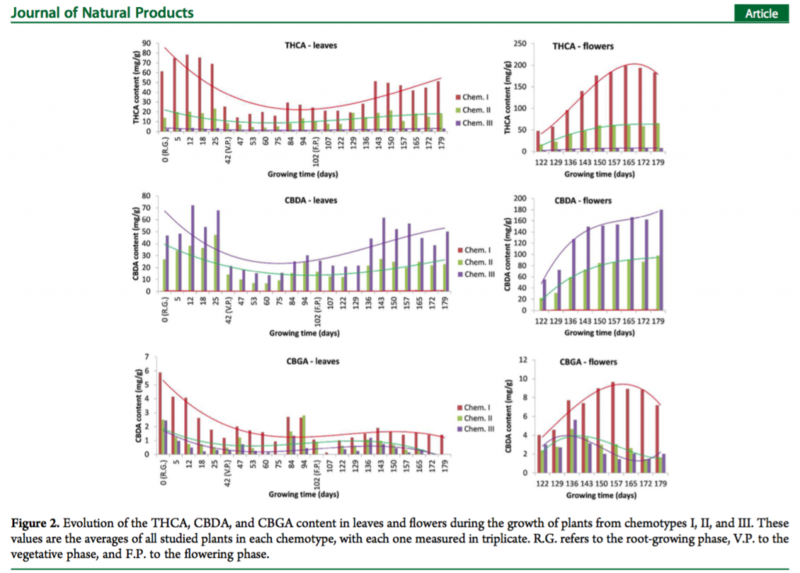 Monoterpene production displayed the same evolution trends found with THCA and CBDA (Figure 2). Sesquiterpenes exhibited a different pattern of concentration throughout the growth cycle. After the flowering period, sesquiterpene production in all three chemotypes remained stable, whereas monoterpene concentration was abundant after the flowering phase. 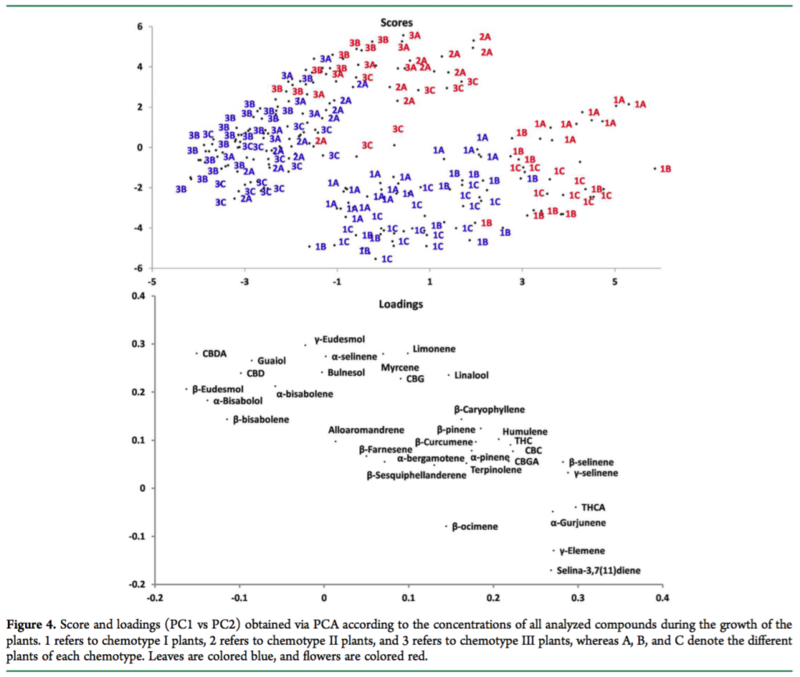 “As observed in Figure 4… there was a clear distinction between chemotype I plants from the rest (two clusters) and between the leaves and the flowers in each cluster (leaves in blue and flowers in red). The chemotype II plant was closer to the chemotype III plants than the chemotype I plants, most likely because of its higher CBDA content. From the loading projection, the cannabinoids and terpenes of each class of samples were identified as those that are similar to CBDA and THCA. Thus, the higher CBGA and CBC content can be attributed to chemotype I plants. Moreover, terpenes, such as β- eudesmol, γ-eudesmol, guaiol, α-bisabolene, α-bisabolol, or eucalyptol, were much more pronounced in chemotype III plants, whereas γ-selinene, β-selinene, α-gurjunene, γ-elemene, selina-3,7(11)diene, and β-curcumene were characteristic of the chemotype I plants. This chemotype-dependent terpene distribution was also observed in the correlation analysis of the data. Cannabis has been sorely misrepresented in the scientific world, so the efforts required for studies such as this one should be appreciated by our industry and our community. 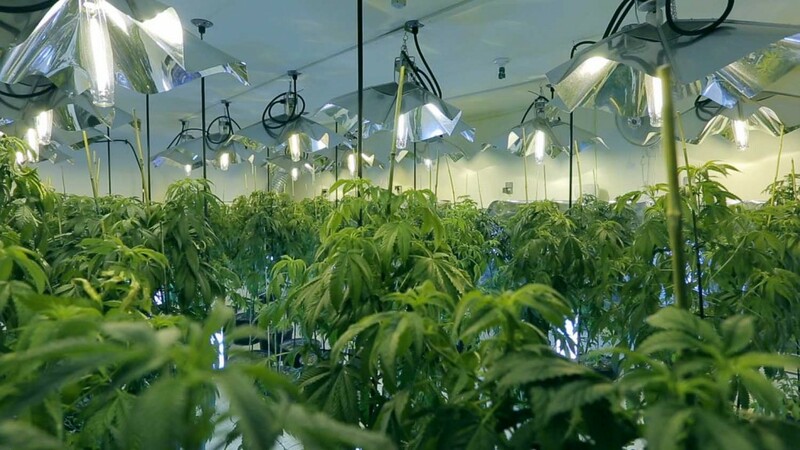 The results of this particular study show encouraging opportunities for cultivators and breeders to further improve their cannabinoid production methods. Understanding cannabinoid production rates will allow for future projects and research to focus on better breeding techniques and methods for developing cannabis genetics that contain specific profiles of cannabinoids, terpenoids, and even flavonoids. Every opportunity to increase our overall knowledge about cannabis science is a very positive step in improving the way we discuss this plant and its chemical components. Cannabis Reports supports all cannabis studies because clinical data will help us all better understand our relationship with cannabis. Check out our science feed for future examinations of cannabis research. For the most up to date info on Cannabis Reports, follow us on Twitter, and like us on our Facebook page. As a matter of fact the latter says that their Carmagnola plants loose CBD content 11 weeks after sowing, while Oier Aizpurua-Olaizola says that it keeps on increasing (see fig.2) and both are chemotype III (industrial hemp). The Cannabis Reporter is the official news source from Cannabis Reports. "Cannabis deserves a better conversation."